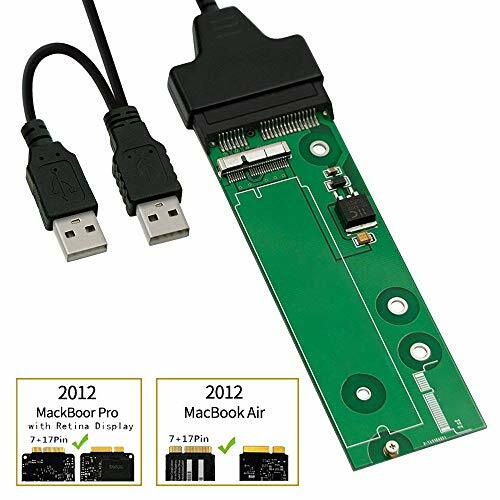 MECHREVO SSD to SATA or USB Adapter Card for (2012 Year ONLY) Macbook Air and Pro Retina with Cable, HDD Hard Disk Drive Converter, Support 2012 Year Model A1465 A1466 by MECHREVO at Andy Pemberton. MPN: 43237-28829. Hurry! Limited time offer. Offer valid only while supplies last. Allow 2012 Macbook air (7+17Pin) ,2012 and early 2013 macbook Pro Retina (7+17Pin),2012 iMac SSD to work as a normal SATA SSD or External Hard Drive.